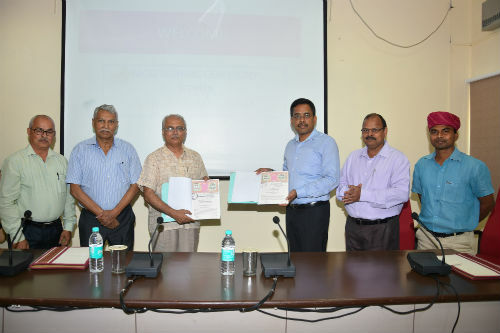 Bhubaneswar: The Memorandum of Understanding was signed between ICAR-CIFA and Bihar Animal Science University (BASU), Patna on 16 April, 2018 in the Conference hall of the Institute. The MoU was signed between Dr. J.K. Sundaray, Director, ICAR-CIFA, Bhubaneswar and Dr. S. Samantray, Dean , Bihar Veterinary college in presence of all scientists, Senior Administrative Officer, Finance and Accounts Officer and Administrative Officer of the Institute. Dr. Dilip Kumar, the Aquaculture Fisheries and Rural Development Advisor to the Government of Bihar was also present on this occasion. The MoU was made for long term collaboration for the promotion of training and quality research in the cutting edge areas of freshwater aquaculture for post-graduate students.